The net seems to be going Mockingjay bonkers right now. Ok, maybe not the whole net, maybe just where I’m looking and book related websites , but still to me that’s most of the time I spend on the net. It’s almost to the point where I’m reconsidering posting a review about it because so many people are going on about it and do we really need to read/hear more about it? Do I? I’ve been umming and ahhing over this for the last several days. I don’t know if I can review without massive spoilers as well (mainly because I just want to talk about the spoilers) so what I’ll do is post the spoilers right down the bottom with fair warning for everyone. I was going to re-read The Hunger Games and Catching Fire first before this, but I couldn’t wait and ended up borrowing my mum’s copy (I ordered mine from overseas so have to wait awhile). Apart from an attempt at sleep I read this book in one sitting and even though I had forgotten some of the characters and story line, by the time I hit 100 pages it wasn’t an issue. There’s just enough in the first 100 pages to help refresh your memory, but not bombard you with repeats, instead focusing on the continuation of the story which leaves off 1 month from when the last one began. I don’t feel there is much to say (not concerning the spoilers anyway) except that it was well written just as much as the first two, the atmosphere carried on from the last book well and so too did the story. I can also vouch that this is easy to absorb given I read it while suffering from sleep deprivation, but at the same time it’s not light content and it doesn’t skim on detail. There isn’t much more character development in this book though because you’ve pretty much gotten to know the main players by now, but you can definitely tell the difference between the three main characters in Mockingjay compared to The Hunger Games. In saying that I really appreciate how the characters feel. No one goes through a traumatic experience in this book and comes out all sunshine and roses. There’s quite a bit of post-traumatic stress disorder going on in the story and I think it’s described really well. 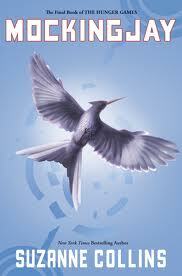 I think this book was finished well and it was interesting to see how Gale turned out with his need to play dirty. Naturally there’s going to be some characters who play dirty and even though you could see it coming (right from the first book) it was still a mild surprise. It did get a little predictable at times, especially with Katniss and Peeta ending up together, but that just also makes sense except I can’t quite accept the jump from Peeta going from programmed killer to lover again. That’s a pretty big leap if you ask me, especially after the whole ‘I’m going to kill you’ part when they went on their mission to eliminate Snow. I can’t quite buy him being able to control himself after being restrained that whole time, but other then that I was really pleased with the ending. At first I was disappointed that Katniss wanted murder as revenge, but when she shot her target, even though it’s still murder, I was much happier. You could see that Coin was just a Snow replacement and I guess that was the only way everything was going to resolve itself so the current government didn’t continue running, but at the same time killing and cold blooded murder isn’t something to be celebrated. So basically in the end it’s an entertaining albeit dark read, well written, mostly thought through, and yet even though it was extremely engrossing it wasn’t highly absorbing for me. I know that might sound bad, but it’s not really. I still highly recommend the trilogy, I just wasn’t moved much, it was really easy for me to put the book down when I finished and really easy for me to move onto the next one. Demographic: Young Adult, but suitable for an older generation as well. Reminds Me Of: The first one reminded me of Battle Royale, but after that it became more warlike. It does give me the feeling of the Gone series by Michael Grant and The Forest of Hands and Teeth by Carrie Ryan.